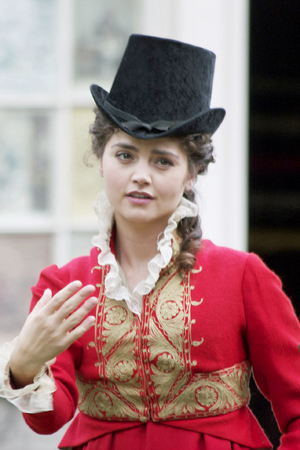 Jenna Coleman may be excited by the latest naming of the Doctor on Doctor Who and that she gets to be in a scene with three of the Doctors together in a scene on the upcoming Doctor Who 50th Anniversary Special airing in November. And we don’t blame her. But we are excited that we finally get a glimpse of her as Lydia Wickham in the upcoming three-part mini-series Death Comes To Pemberley. 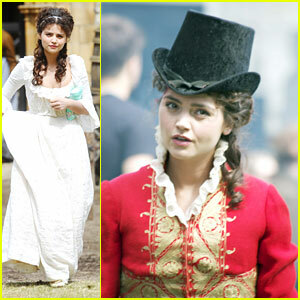 She was snapped in her period costume on Sunday, August 4th during filming and looks quite fetching. 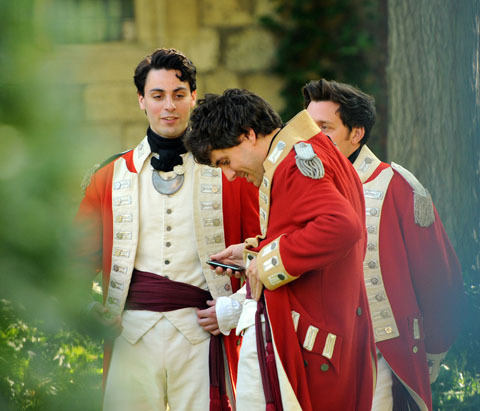 Death Comes To Pemberley has been filming in York and Beverly over the past weeks. You aren’t familiar with Death Comes To Pemberley? It is the TV adaptation of P.D. James’ novel of the same name. It takes place five years after Elizabeth Bennett and Fitzwilliam Darcy have gotten married in Jane Austen’s Pride and Prejudice. It will be airing around Christmas time. 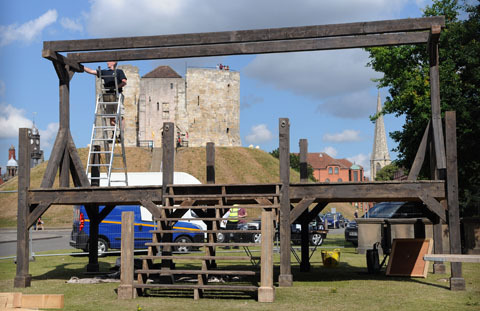 Filming in York continues for the three-part TV mini-series adaptation of P.D. James’ Death Comes To Pemberley. And a few of the behind the scenes shots are of Mr. Darcy!!!! (Mr. Darcy is being played by Matthew Rhys.) 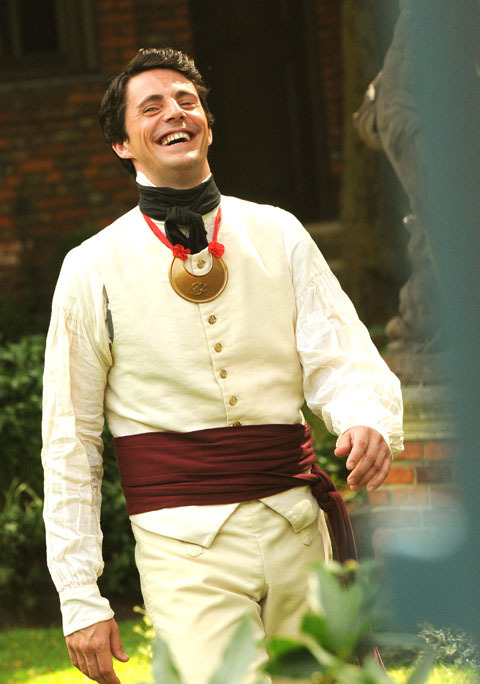 We also get a peek at the dastardly George Wickham played by Matthew Goode. Now, as previously reported, this blogger is not quite sure Matthew Rhys is up to filling the shoes of Colin Firth in the role of Mr. Darcy. But after seeing the pictures of Matthew fully ‘Darcyized’, my objections are less strenuous. He has got the proud look that a Mr. Darcy should have – but is he prejudiced enough??? 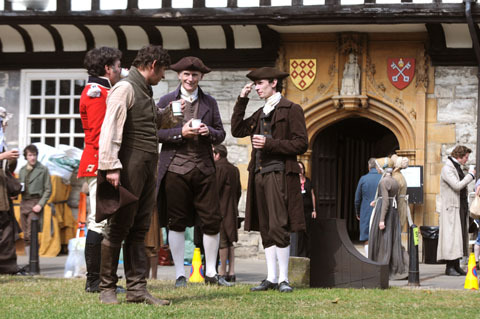 More behind the scenes pictures of the filming of Death Comes To Pemberly have surfaced. 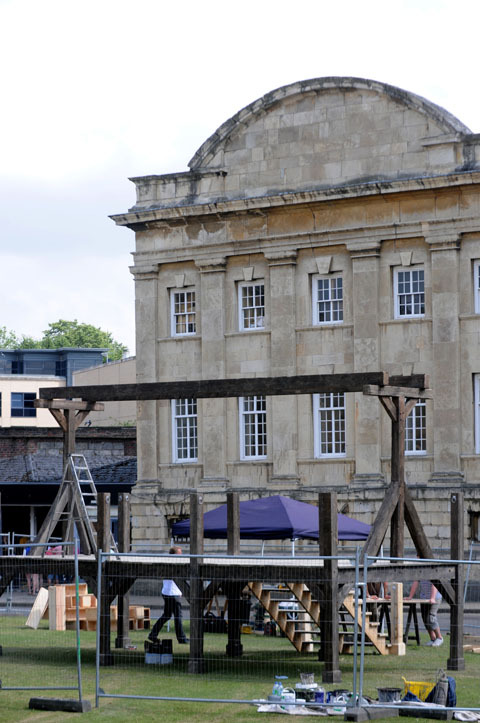 This time it is the gallows scene with the specially constructed gallows – because let’s face it, gallows aren’t used that much these days. Eliza Mellor, producer of Death Comes To Pemberley, said: “The gallows are a particularly dramatic scene from Death Comes To Pemberley, which is being made by Origin Pictures and is due to air on the BBC this Christmas. The TV mini-series based on P.D. James’ novel of the same name is being shot in York and locations such as the Treasurer’s House, Castle Howard, Chatsworth House, and Harewood House are being used. Filming for Death Comes To Pemberley is in full swing in Yorkshire at St. William’s College and The York Press was able to catch some behind the scenes pictures when the cast was on a break. 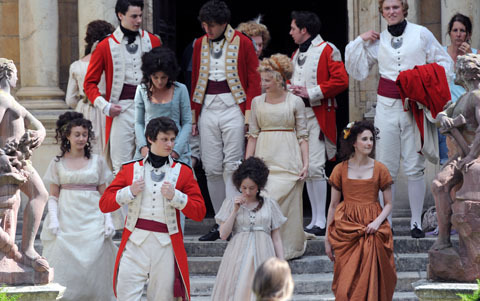 It looks like the costuming is wonderful and the cast is enjoying themselves.